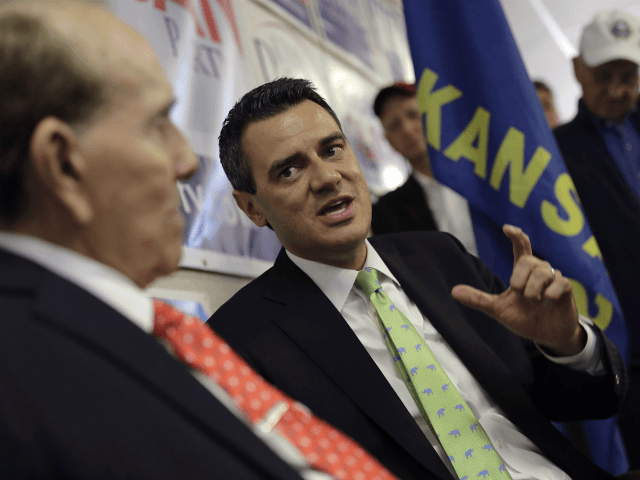 AP/Charlie Riedel13 Aug 2018683Kansas Rep. Kevin Yoder’s catch-and-release spending plan “will encourage further massive waves of illegal immigration into the country,” says Peter Kirsanow, a GOP-appointed member of the U.S. Commission on Civil Rights. “American workers finally have a beneficial labor market after suffering years of high unemployment and stagnant wages,” he said in an August 7 letter to House Speaker Paul Ryan. “Now Republicans in Congress want to blow it by gutting immigration enforcement,” Kirsanow added. Kirsanow, who was appointed to the seven-member commission by former President George W. Bush, is one of the few voices speaking up against Yoder’s July 25 decisive endorsement of a Democratic spending amendment which revives the catch-and-release rules set by former President Barack Obama. The amendment is now in the draft 2019 sending bill, and it would revive Obama’s rules which allowed hundreds of thousands of Central American economic migrants into the United States. The amendment bars President Donald Trump’s officials from spending any money to implement the asylum reforms announced in June by Attorney General Jeff Sessions. Sessions’ reforms are already causing a “dramatic” reduction in successful asylum-claims by migrants, say immigration lawyers. That is good news for Americans seeking a wage raise but is bad news for the lawyers and for cheap-labor employers who gained when 400,000 Central American migrants got work permits in 2017. So far, White House officials have been publicly silent on the Yoder’s July 25 giveaway to the cheap-labor employers. The giveaways also included expanding the H-2A and H-2B visa-work programs and also changing green-card rules in a way that could dramatically boost white-collar outsourcing of professionals’ jobs to Indian companies. It seems as if this is coming in under-the-radar and it could be passed without sufficient time for discussion … This is really a big deal — it eviscerates any notion of having control of the border. Without Sessions’ reforms, people cross the border to claim asylum, and then disappear into the illegal-migrant workforce, he said. White House officials have declined to answer questions from Breitbart News about the apparent lack of response to Yoder’s giveaways. Sessions called Yoder July 25 to protest the pending amendment, but Yoder rebuffed Sessions. There is no evidence that Yoder has followed up on his July 28 promise to fix his asylum giveaway, sources have told Breitbart News. … illegal immigration (and high levels of immigration generally) are largely responsible for the declining employment prospects and wages of low-skilled Americans generally, and black men in particular. Right now, unemployment is at 3.9 percent. Black unemployment is at 6.5 percent. We could only dream of these numbers while mired in years-long stagnation. We have more people re-entering the workforce after spending years not even looking for work. And wages are finally ticking up – MarketWatch reports, “the cost of worker compensation in the form of pay and benefits edged up to 2.8% to mark the biggest yearly gain since 2008.” In short, American workers finally have a beneficial labor market after suffering years of high unemployment and stagnant wages. And now Republicans in Congress want to blow it by gutting immigration enforcement. The Washington-imposed economic policy of economic growth via immigration shifts wealth from young people towards older people by flooding the market with cheap foreign labor. That process spikes profits and Wall Street values by cutting salaries for manual and skilled labor offered by blue-collar and white-collar employees. The policy also drives up real estate prices, widens wealth-gaps, reduces high-tech investment, increases state and local tax burdens, hurts kids’ schools and college education, pushes Americans away from high-tech careers, and sidelines at least 5 million marginalized Americans and their families, including many who are now struggling with opioid addictions. Business groups and Democrats tout polls which prod Americans to declare support for migrants or the claim that the United States is a “Nation of Immigrants.” The alternative “priority or fairness” polls — plus the 2016 election — show that voters in the polling booth put a much higher priority on helping their families, neighbors, and fellow nationals get decent jobs in a high-tech, high-immigration, low-wage economy. So far, White House officials have been publicly silent on the Yoder’s July 25 giveaway to the cheap-labor employers. I'm glad someone other than me has noticed this silence from the WH. Last edited by stoptheinvaders; 08-14-2018 at 01:20 PM. Beezer, MW and Scott-in-FL like this. Mr. President, how about using your twitter for the important things that really matter to this country instead of using it to whine and complain about everyone who says a negative word about you.